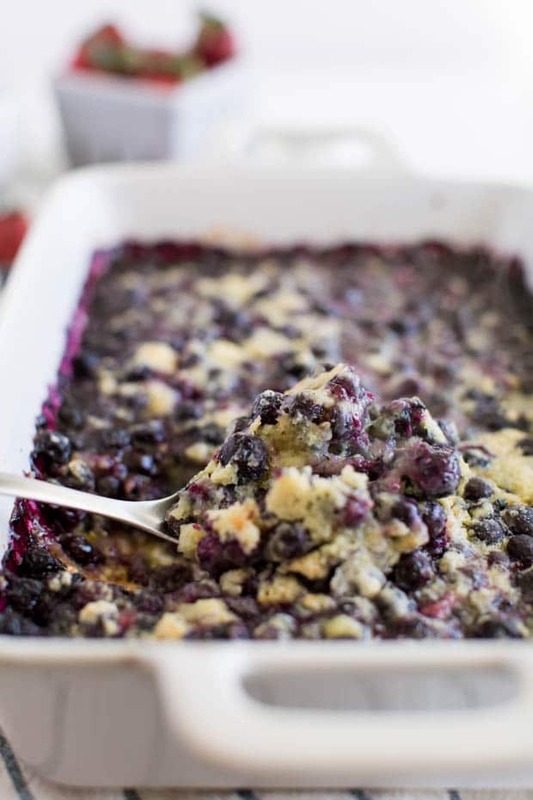 This easy Blueberry Cobbler Recipe bursts with flavor. 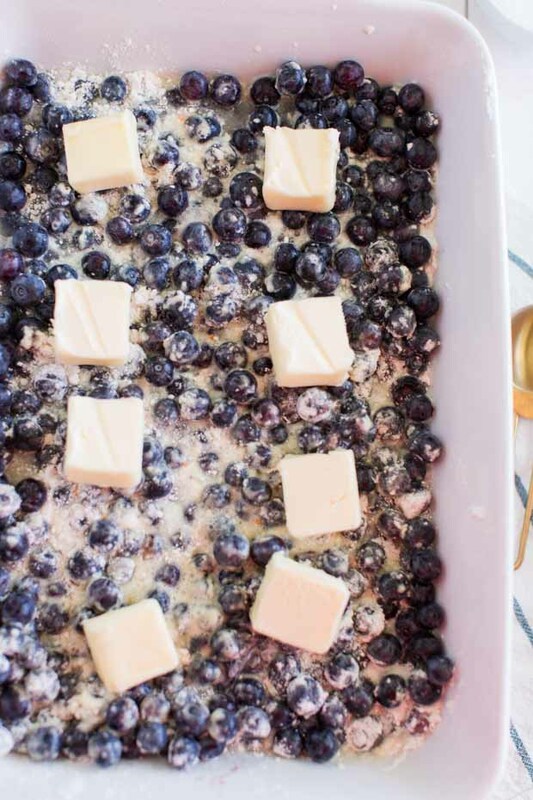 The filling comes out perfect every time after baking and you can create it with fresh blueberries or frozen making it a great option for last minute guests! I suggest trying this blackberry cobbler or this wonderful peach cobbler recipe soon, too! A cobbler can describe a variety of dishes. We know it as a fruit or savory filling poured into a baking dish with batter or biscuits before being baked. The possibilities are endless because there are so many filling choices! 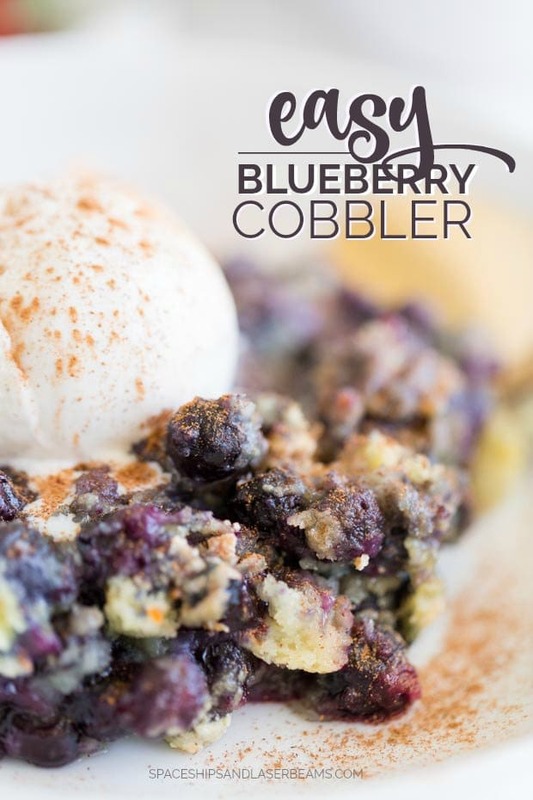 Personally, I feel like this blueberry cobbler is the best ever — especially when served hot with a scoop of vanilla ice cream on top! Grab a 9×13 baking dish and pour on box of yellow cake mix in the bottom. Next, spread your blueberries over the top of the cake mix. Sprinkle 1-2 tablespoons of sugar over the blueberries. Pour the 1 1/4 cup of water over the top of the berries and cake mix. 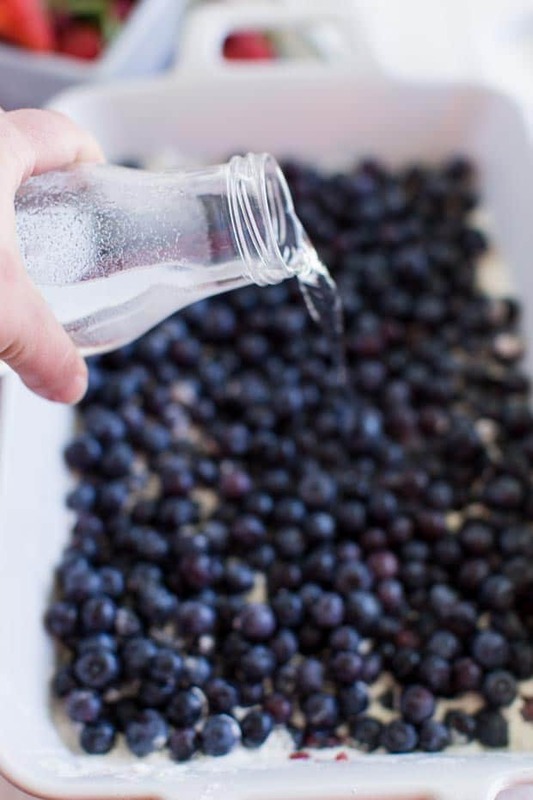 Gently toss the berries and cake mix to allow the water to settle towards the bottom of the baking dish. You can give it a little shake if you need to. If the berries aren’t very juicy, you’ll want to add a little more water. If they are plump, you’ll want to add a little less water. Cut the stick of butter into 8 pieces and spread evenly over the top. Pop in the oven to bake for 45-50 minutes. The amount of sugar and water you use will vary on the berries themselves. Before you start, make sure you taste the berries so you add the right amount. I know. Twist my arm to eat blueberries. If they’re sweet, you won’t want as much sugar. If they’re tart, you might want a little more. This is one of those recipes where you can have a little fun and get a little creative with the amounts. It’s also really important to pour the water over the top and then be sure everything is mixed. You want the berries and the water to settle into the pan before baking! 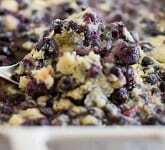 If you’re going to freeze your blueberry cobbler, make sure it’s in an airtight freezer safe container. Once you’re ready to serve, it’s best to thaw in your fridge over night. Then, pop into the oven and bake at 350 degrees until everything is warm and bubbly. I love popping things into my freezer. It can be such a time saver. Plus, it helps me save money since I’m not wasting ingredients, so I really appreciate that aspect as well. And don’t forget the delicious, sweet vanilla ice cream — it’s the perfect cobbler topping. 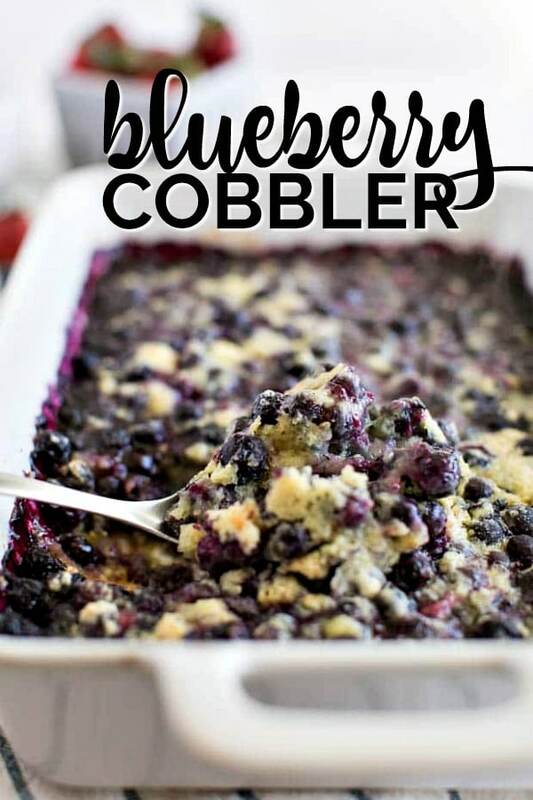 This easy, delicious blueberry cobbler recipe is a breeze to make and wonderful to eat! 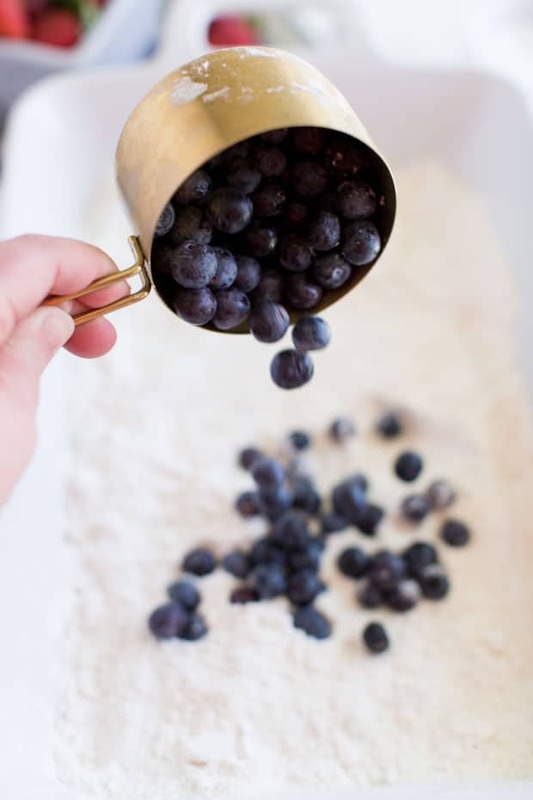 Spread the blueberries over the top of the cake mix. Pour 1 1/4 cup of water over the top of the berries and cake mix. Gently toss the berries and cake mix to allow the water to settle towards the bottom of the pan. (Sometime I give it a little shake too) If they berries aren’t very juicy, add just a little more water. If they are plump, a little less. Note: some of the ingredients, like sugar and water can vary on the berries themselves. Before you start, make sure and taste the berries so you can be sure and add the right amount! It’s also really important to pour the water over the top and shake the pan. You want the berries and the water to really settles into the pan! Love this recipe so much! Made half of recipe using 2 cups of blueberries. 1 tbsp sugar. Thank you!! Dfo you think I could use 23 cake mixes? I like more Bread with all those blueberries. Would I double everything but the blueberries? I haven’t tried it like that, so I can’t speak for how it would turn out. You could definitely give it a whirl and see!